Somewhere in the middle of Patagonia, a middle-aged man wearing a gaucho-style hat stands over a pit of roaring flames, stirring fire wood with a shovel in one hand and sipping a glass of merlot in the other. We are of course talking about one of the most celebrated chefs in Argentina, Francis Mallmann, an expert at grilling (or burning) food over an open flame. After spending many years with the best chefs in Paris, Mallmann went back to his native Argentina and continued serving gourmet haute-French food to wealthy Argentines. He eventually grew tired of it and the pretentiousness that came along with it, including his own. So he decided to return to his native roots as a young child growing up in Patagonia. Ever since childhood, Mallmann was always intrigued by how the gauchos and Indians cook with Argentine ingredients and wood fires. As primitive as it may sound, Mallman’s method of cooking comes down to an exact science. He is obsessed with all aspects of cooking with fire, the coals, ashes, etc. He is a master of his craft when it comes to Patagonian pit cooking, known as curanto, in which potatoes, vegetables, and/or fish are wrapped up in a large muslin cloth and then steamed underground for hours, not to mention his preferred style of grilling (or smoking) an entire animal over a pyre. Mallmann talks about how every young chef or artist or writer wants to emulate his master and then the relationship slowly loses its creativity and passion. At some point in life, one has to turn around and find a new path of his own so that the next person can take his place. 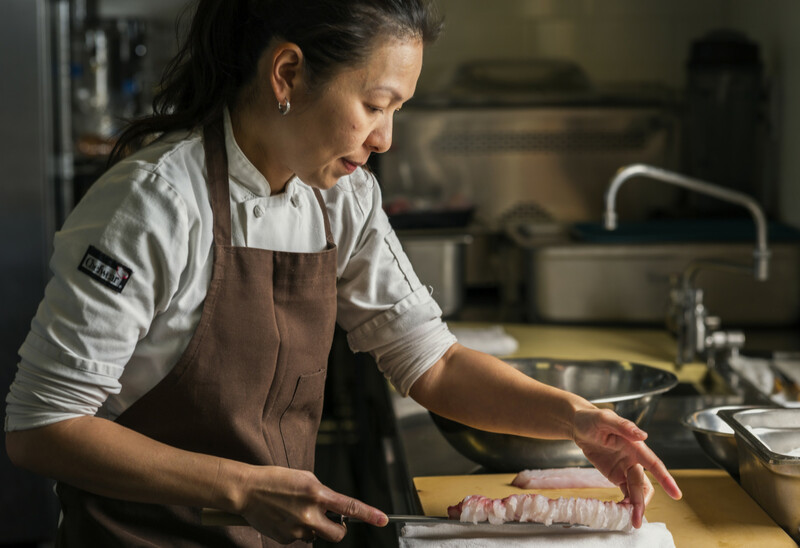 Niki Nakayama is an extraordinary Japanese American chef who began her career working under the guidance of renowned chefs Takao Izumida and Morihiro Onodera at their notable Brentwood establishment Takao. Her philosophy of cooking is based on kaiseki, a traditional multi-course Japanese dinner which consists of a sequence of dishes, each small, refined, and artistically presented. While traveling abroad in Japan for three years, Niki immersed herself in the many different styles of Japanese cuisine, based on regional flavors and the seasons of the dish. She stayed in a relative’s ryokan, or Japanese inn, where she became an apprentice for chef Masa Sato and learned the art of kaiseki. It is an art form that is carefully balanced by the sequence of dishes, taste, texture, style, and color while using the freshest local ingredients to enhance their flavor. Following her journey, Niki returned home to Los Angeles and opened up her first restaurant, Azami Sushi Cafe with some help from her family. Although it was successful, she felt that she was limited in her freedom to express her creativity and independence. Nikki describes her struggles of being a female chef in Japanese cuisine which has been traditionally a male profession. Although she is soft-spoken, she speaks of kuyashii, a Japanese word that describes one’s desire to prove someone wrong when challenged or doubted upon. It is this inner drive and dedication that has earned her esteemed recognition in the art of Japanese cuisine. Niki and her staff meet often to discuss the upcoming reservations and the serving of their customers’ favorite dishes, something she learned along the way from her predecessor Takao Izumida.